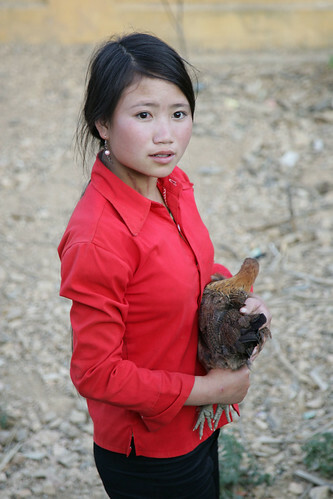 Left: A Hmong girl, 13-year-old Hi Hoa Sinh, holds a native black chicken in the village of Lung Pu, northern Viet Nam; Right: One of Viet Nam’s native black pigs on the farm of Ma Thi Puong, near the northern town of Meo Vac (photo credit: ILRI/Mann). A project funded by the Global Environment Facility has selected Vietnam, a country with a wealth of livestock diversity, as one of four countries in which to implement a project to conserve livestock genotypes. Vietnam’s Ministry of Agriculture and Rural Development has made the National Institute of Animal Husbandry as the Vietnamese partner in the project. The project aims to enhance livestock keepers’ awareness of the importance of the genetic conservation of indigenous livestock while helping them to raise their incomes through adoption of indigenous livestock breeds. 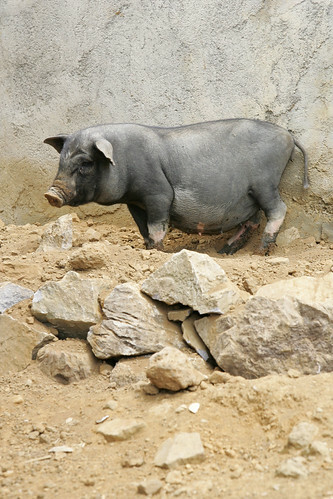 The project is being implemented over 4 years (2010–2012) in Vietnam’s Son La and Bac Ninh provinces, with a focus on indigenous chicken and pig breeds. The project will train farmers on survey methods and data collection; on ways to maintain their use of indigenous animals; on livestock management; and on business skills in such areas as as tourism with traditional cuisine and cultural activities. Basic information about valuable indigenous breeds and representative animals is needed, as is the capacity to prioritize, monitor and manage them at both scientific and farm operational levels. Stakeholder groups need to be empowered with knowledge and conducive operational environments in which they can make decisions that work best for them. Agriculture in the partner countries in this project contributes 20 to 26% of gross domestic product, of which livestock contributes approximately 15 to 20% in terms of income, insurance, food (meat, milk, eggs), hides/skin, traction and manure. It is mostly smallholder farmers who are dependent on indigenous breeds. These animals have evolved in diverse tropical environments and possess valuable traits such as disease resistance, adaptation to harsh environments, including heat tolerance and ability to utilize poor quality feeds, attributes essential for achieving sustainable agriculture in low-input production systems. However, it is still largely unknown which breeds hold significant genetic diversity or specific genes that should be targeted for conservation and/or incorporation into breeding programs. In the meantime, crossbreeding with exotic breeds is increasing and indigenous breeds are being lost. The development objectives of this project are to help conserve the indigenous livestock of the partner countries for future generations and to help increase the contribution these native breeds make to the livelihoods of poor people. The first goal of the project is to develop and to make available effective tools to support decision making for the conservation and sustainable use of indigenous farm animals and their wild relatives in developing countries. For more information, see the project’s description on ILRI’s Biotechnology Theme webpage.